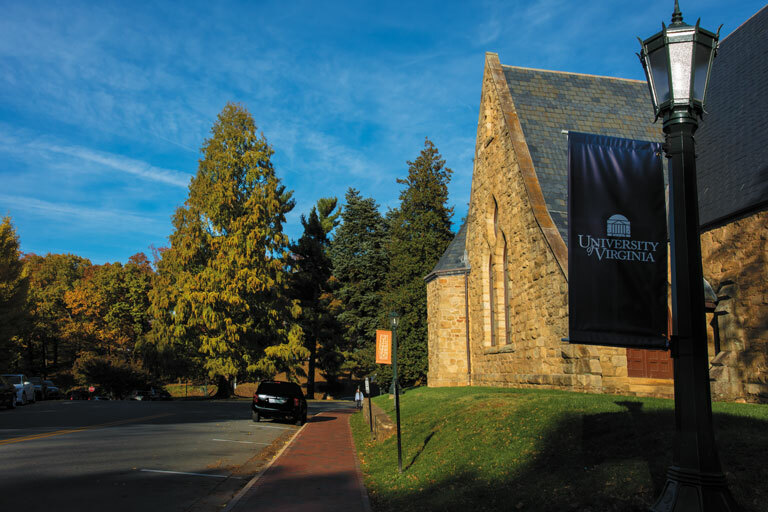 In the center right of this image is one of several sycamore trees in the grassy expanse between the chapel and the Rotunda. 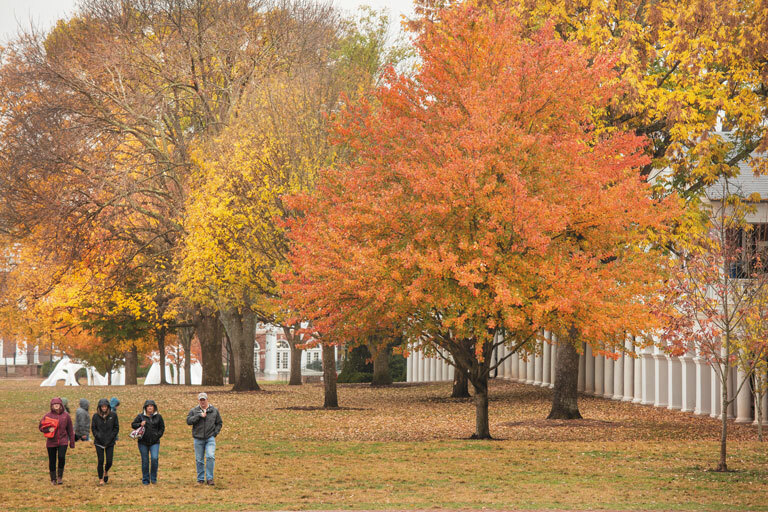 UVA landscape architect Mary Hughes (Arch ’87) estimates that the sycamores were planted in the mid-19th century. “You can see them in the photographs taken of the fire at the Rotunda in 1895,” she says, “and they were already pretty large trees. 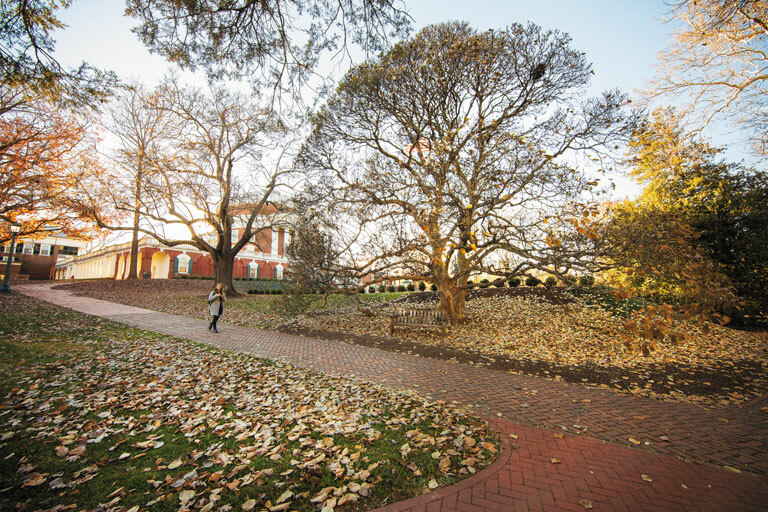 So they were probably planted by William Pratt during the time he was beautifying that area in front of the Rotunda.” Not visible in this photo is the scarring from a lightning strike in 2017—the second time this tree has been hit, according to UVA arborist Jerry Brown. Rare is the person who can walk by the Pratt Ginkgo in late fall without stopping to stare at branches full of gold coins, shining in the light. And if you’re fortunate enough to be in the right place when the cold snap hits, you’ll see the leaves drop in a sudden, shimmering, golden rain. But fall isn’t the only magical season for the trees on Grounds. Any time of year, the foliage invites a glance upward, and we find ourselves awed by stately grandeur. Historians might disagree whether Thomas Jefferson ever planned to have trees planted on the Lawn of his Academical Village. But to study beneath one of its majestic ash trees—among the oldest trees across Grounds—well, if that’s not on every student’s wish list, it should be. Trees evoke mystery, nostalgia, even romance. Just ask Bethy Hagan (Col ’11). She and then-boyfriend Shawn Flaherty (Col ’08, Com ’09) often met up under the Yulan magnolia to spend a few moments together amid the bustle of college life. That one tree grew to mean even more to them both last fall. Flaherty plotted with the Office of the Architect to secretly endow the tree in Hagan’s name. He then orchestrated a visit back to Grounds with Hagan and her siblings for UVA’s bicentennial launch in October. After surprising Hagan with the endowment certificate under the magnolia’s canopy, Flaherty got down on one knee and proposed. The rest of the family joined them in celebrating. The two were married in July. Whether you recall one particular tree or simply the fragrance and towering beauty of many, let these photos take you back in time. Some are trees you might also have overlooked: That’s always been there, and I didn’t see it. 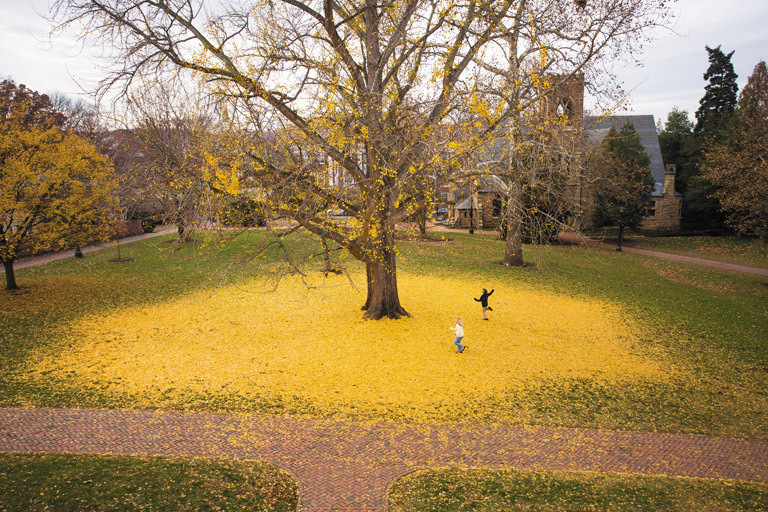 “They are right in front of you, hiding in plain sight,” says photographer Robert Llewellyn (Engr ’69) about the majestic trees of Grounds. No one knows the exact date the Yulan magnolia was planted just northeast of the Rotunda, but Hughes estimates that it’s about 100 years old. The magnolia is one of more than 140 memorial trees on Grounds—this one in honor of Elizabeth Anne Hagan and Shawn Patrick Flaherty. Children often skip the bench to sit on one low-hanging branch that just begs for a climb, according to Brown. Sugar maples, red maples and ash trees predominate on the Lawn, planted when the original black locust trees started dying out at the time of the Civil War. And they’re evaluated twice a year. “They’re pampered,” says Brown. That pampering includes being inoculated against the emerald ash borer, an invasive beetle that has killed tens of millions of ash trees across the country since 2002, according to the U.S. Department of Agriculture. 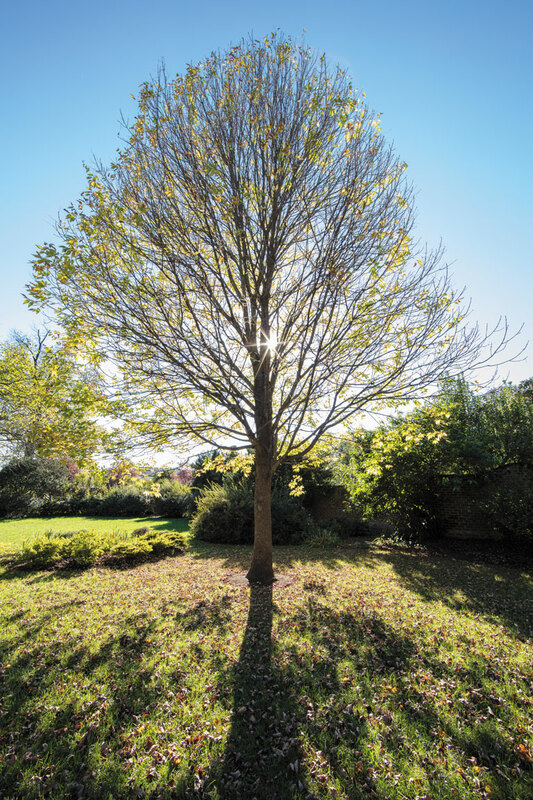 I appreciate this introductory article about the rich heritage of trees on the Grounds of the University. As I walked daily to the nursing school I admired and wondered about many of them. Thank you for this article, which was absolutely transporting. It reminded me how much I loved the landscape of UVa, and how much I love autumn. What a treasure our environment is, and thank you to those who seek to preserve and sustain it. I’m a novice member of CATS - Charlottesville Area Tree Stewards, and am so glad to see an article providing additional reasons (go McDougall & Llewellyn!) for being a supporter of trees for the sake of U.Va. and our environment. Thank you for providing a link for info about the rest of the 140 memorial/commemorative trees. Does one of the offices/departments on “the Grounds” provide tours/tree walks regularly? If so, who can I contact to participate? My father, Edwin M Betts. was a Biology professor who loved the trees at our University. He would have approved of this outstanding article. I approve of it also….thanks! My mom remembers going to visit her grandparents who lived in the Booker House across from the Yulan magnolia. She remembers playing on and under it as a child in the 1950s. I’m sure I wrote that somewhere…probably plagiarized. Seems the Aggies see trees only as Big dollar signs needing to be felled into their cash registers. Soon we won’t have to go to Mars to find endless desert proving we can live there - we have Phoenix, don’t we? Maybe we’ll be able to see the top of the Statue of Liberty from top of the Rotunda with a sea of sand between. Ok, lets save the trees as our alma mater has done. Trees are the gift of God and the friend of man, so reported a U.S. Department of Agriculture annual publication. The USDA did not know who wrote / said this. Do you? I began my UVa grad program in Planning in 1976 coming from California. My first elective class was Tree Identification because our campus offered such a rich diversity of plants beyond those I knew in the West. My undergrad degree was Park Administration. Whenever possible I did my homework under and around some magnificent specimen. I will have to lament the naked Rotunda without my favorite Magnolias whose scale will never be replaced for a very long time. I loved this article on the stately trees around the grounds. Please continue to provide articles like this. Enjoyed the article. But . . . Please accept this strong request that you (and all others at VIRGINIA Magazine) revise your reference to the Grounds of the University of Virginia as “Grounds”.
. . . , this letter is written to respectfully request that you and others at the University refer to the places of the University of Virginia as “the Grounds” and not as “Grounds”. As in, Come to Grounds. The word grounds by itself is appropriate when referring to what is left after the good flavor has been extracted from coffee beans or, in the singular, describing where foxes hide during a hunt. My Undergraduate years at the University built an appreciation of the values of tradition and the importance of reverence for place. While those attending other schools used the word “campus”, at UVa we learned to honor, respect, and refer to our place as “the Grounds”. 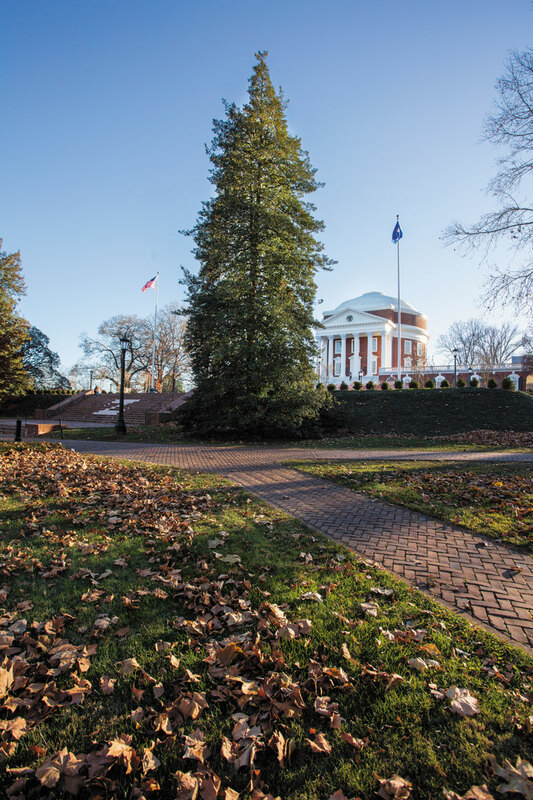 While the words campus and grounds can mean similar territories, they should not be juxtaposed when applied to the buildings and grounds of the University of Virginia. UVa is a campus and there should be no problem in using that term to describe it as such. If your mind says “campus”, then be comfortable in saying that. It’s OK. However, tradition holds that the word “grounds” when used in reference to the University should always be capitalized and be preceded by the marking article “the”. Here, as Dictionary.com says, “the” is used . . . to mark a proper noun, natural phenomenon, ship, building, time, point of the compass, branch of endeavor, field of study, or place as something well-known or unique. 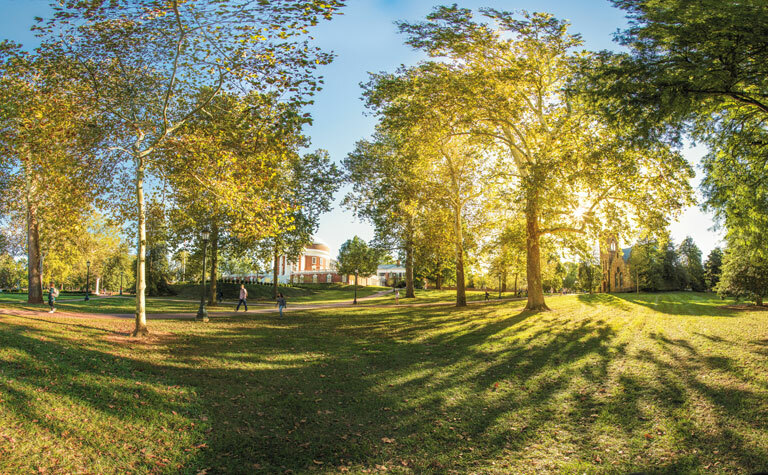 The Grounds of the University of Virginia are such a unique place. That trip through the amazing trees of UVA was fantastic. Thanks for thinking to publish it and show the pics. UVA has so many incredible tree on grounds. I think you should do a series of articles on the trees of UVA.